Thankfully horses are no longer automatically condemned to stand for months in their stalls immediately after pulling a tendon. If the severity of the tendon injury allows, many vets advocate walking a horse in hand or on the horse walker in addition to stall rest during the recovery process. Your vet will probably prescribe twenty minutes of walk a day, adding five minute increments each week until you are up to one hour at the end of eight weeks. Standing in a stall all day is boring and stressful for horses. Whenever possible – and with your vet’s agreement – divide the permitted exercise period into two daily sessions. Your equine patient will benefit greatly from this. Add soothing activities such as daily grooming, and ask about appropriate massage and stretching techniques. Your horse will quickly associate your visits not only with a chance to get out of his stall: he’ll also look forward to relaxing with you inside it. If you perform this ritual before taking him for his daily walk, he’ll stand still for you and not be inclined to rush out of his stall as soon as you arrive. A european style horse walker is ideal for beginning your horse’s walking program, as it allows him to move naturally within a restricted area. Your vet will stipulate working in straight lines or very large circles, so the wider the circumference of the horse walker, the less stress placed on the tendon injury. A horse exerciser roof cover over the track is an added bonus when the weather is inclement. Keep an eye on him the whole time during his exercise. When a horse exerciser is not available or you prefer to walk your horse in hand, don’t be tempted to use the halter, no matter how quiet he normally is. He’s not getting any turnout and will probably be frustrated by his cramped lifestyle, so use the bridle for extra control. A mild sedative (as mentioned above) may also be appropriate. Walk him on flat surfaces with level footing and consider putting on brushing boots for added protection. Now is not the time to save money on farrier’s fees: be sure to keep your horse’s feet well-trimmed and/or shod, depending on his usual requirements. Discontinue exercise and notify your vet immediately if you notice any swelling, heat or lameness. After the initial weeks of mild exercise, your horse will have another ultrasound to ensure his tendons are on the mend. All being well, he is ready to progress to the next step. Equine rehabilitation is a long process, so don’t be disappointed when your vet decrees yet another two months of walk. At least you can now start riding! This is a useful time to improve your position in the saddle and get more in tune with your equine partner. You can also put him back on the horse walker, but place a substantial weight on his back, such as a heavy Western saddle, until you move on to riding him. Once again, you’ll probably start with twenty minutes, increasing by five minutes per week, to allow the tendons to strengthen under the extra weight. You’ll be back to sixty minutes of walk at the end of this phase. You may feel safer beginning your under saddle work with a competent friend walking alongside, holding an attached lead rein for maximum control. The best method of fastening the lead rein to the bridle is with a lead rein coupling, which attaches separately to each bit ring. This is available online at a reasonable price, and also known as a Newmarket coupling. Or you can thread the lead rein through the bit ring on the left and clip it onto the right bit ring. Don’t clip it to only one bit ring, as this will cause your horse great discomfort. In the event that you have no one to help during these first few rides after his injury, consider using a stronger bit, or a double bridle if your horse is used to wearing one. You’ll feel more relaxed in the saddle and help your mount chill out, too. 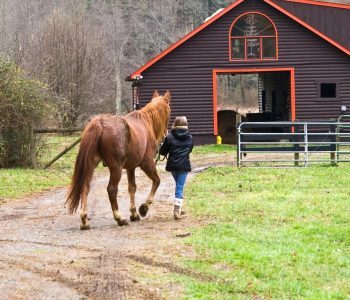 The walking phases of equine rehabilitation quickly become boring: once you’re in the saddle you may be tempted to trot, ahead of your vet’s schedule. But remember, in addition to the tendons your horse damaged, his muscles and other ligaments have also become weaker through lack of real work. They will remodel and strengthen during the course of his planned exercise regime, but you must give them sufficient time to adjust to their increasing workload. If you ask your horse to perform above his fitness level, you will do further injury. I once watched a frustrated owner ask her horse to trot too soon, and he immediately became lame. Instead of competing again, he turned into a pasture ornament for the rest of his life. Her months of work up till then were wasted – not to mention her vet’s bills. Patience is the keyword. It is vital to follow your vet’s advice to the letter. Keep the end goal in mind, work diligently through the program and give your horse the best chance of returning back to his former self. Until your vet says otherwise, your horse needs to stay on stall rest except for when he is being exercised. Turnout is not a good idea: horses’ high spirits can lead to re-injury just as they are beginning to heal. What If My Horse Does Something He Shouldn’t? With all this talk about controlled exercise, no turn out and keeping your horse calm so his tendons can heal, it’s easy to become a nervous wreck if he does happen to get away from you or have a bucking fit. At the end of this second walk phase your vet will perform another ultrasound on the injured tendons. If the healing process is continuing as expected, it is time to add the trot, which we’ll examine in our next post. Even though the heat of the summer is over, it is still important that your horse stays hydrated; which isn’t possible if his water freezes. This isn’t as common of a problem for horses that are stabled through the winter, but it’s of utmost concern for horses that are always outside. There are water heaters made specifically for outdoor water buckets, so you’ll never have to worry about your horse not having access to liquid water. If this is not an investment that interests you, be sure to check the water at least once a day to ensure it is not frozen. 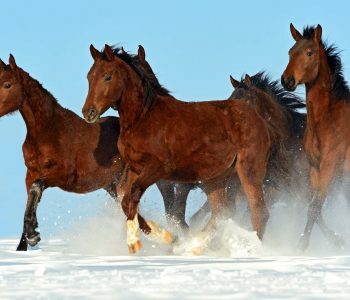 Horses (like humans) burn more calories in the cold winter temperatures in order to stay warm. A great way to ensure that your horse stays warm on those especially crisp days and cold nights is to provide extra hay. Hay is the best way to keep the horse’s digestive furnace burning. If your horse is does less work or gets less exercise in the winter, consider reducing or eliminating grain and increasing the hay ration. 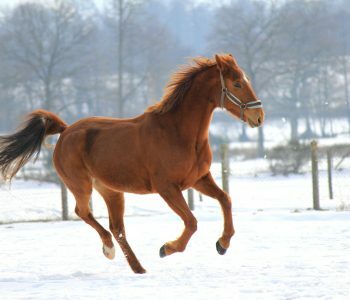 Logically, it is very important to continue to exercise your horse regularly during the winter months. For those owners with access to an indoor arena, this is not typically a problem. Owners who do not have a place to ride may want to consider investing in a horse exerciser or horse walker. 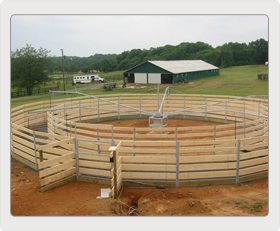 This equipment can provide a great alternative to an indoor arena, especially the track covered horse exerciser. When it’s cold, it is critical that you provide ample time for your horse to warm up and get loose before putting him to work. For horses that are back sore or tend to be extra stiff in the cold, put a heating pad on his back for 10 minutes prior to exercise. This will help him warm up faster and make him more comfortable. It is essential not to over work a horse in the winter, because the cold can greatly increase his susceptibility to tendon and ligament injuries. If your horse is out of shape, be sure to ease into workouts and slowly increase your exercise regime. Lastly, it is equally necessary to allow plenty of time for your horse to cool down slowly before putting him out or back into his stall. A quick transition from hot to cold will make your horse stiff and can cause muscle and joint pain and tenderness. Whether or not to blanket your horse is often controversial. The quick answer is that it depends both on the horse and the situation. A horse that is worked throughout the winter, especially one that is body clipped or trace clipped, needs to have both sheets and blankets. Older horses, sick horses, or thin rescue horses may require the extra warmth a blanket offers in the colder months. Healthy horses that live outside in the winter really do not require a blanket, as their thick natural coat is designed to keep them warm, even when covered in snow. Although they may feel cold to the touch, remember that their insulating layer traps heat next to the skin. Be sure, however, that they have some form of wind break, shelter or run-in shed in which they may take refuge from the elements. 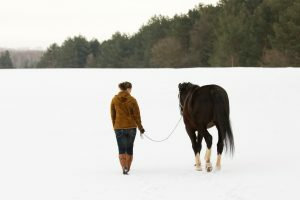 Grooming in the winter is still necessary to keep your horse’s coat healthy, and it is a great way to enjoy the company of your horse if you are unable to ride. So bundle up and go enjoy the fresh (albeit cold) air with your horse this winter! Winter is on the horizon. This is not always the best time for horses to exercise and ride. You might see this as a good time for you and your horse to hibernate indoors, enjoy the holidays and relax. Planning some time for fitness and exercise will help your horse retain some muscle tone and endurance, minimizing risks for injuries in the more accommodating spring weather. One of the disadvantages to exercising outdoors in the wintertime is that ground surfaces can be uneven. This gives your horse more opportunity to strain tendons and muscles as you ride. Spending less time on your horse lowers the chances of muscle strain, but riding less can minimize exercise and cause a loss in muscle tone. Stick to locations with a reliable footing surface to lessen the risk without taking fitness out of the equation. Using a horse exerciser is one way to ensure that horses get enough physical exercise to prevent loss of muscle tone and strength during the winter months. While many horses are given time off in the wintertime because there are no shows or upcoming competitions, it’s still important for them to stay physically fit. Letting them stay in the stable and eat hay may be relaxing, but it will require extra efforts come springtime. A daily exercise routine without riding can do just that. If cooler temperatures and poor weather conditions due to precipitation happen more often than not, you may wish to keep your horse indoors or in a protected area. Providing ample warmth and an opportunity to get exercise to walk or run and stay warm and dry are also options, however. Using an indoor arena during the winter months can prevent outdoor discomfort for your horse, as well as for the trainer, while keeping those extra pounds at bay. Limited time availability during daylight hours can also put a damper on winter exercise. Set a consistent routine for your horse to have ground training and exercise, even when you’re not available to ride or the weather isn’t cooperating. For horses that have a minimal exercise routine during the winter months, it’s important that they receive a body conditioning score before planning out their springtime workouts. Finding out what its needs are can help you create a balanced plan that will help in conditioning and achieving the proper weight for shows and competitions.